This traditional leather chair will add a touch of style and comfort to your living room or den. The plush seating ensures you'll stay cozy, while details such as picture frame seams on cushions, and antiqued brass nail head trim on the rolled arms make this chair a sophisticated choice for your traditional home. This high quality leather chair is perfect for everyday use. 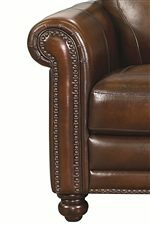 The Hamilton Traditional Leather Chair with Nail Head Trim by Bassett at AHFA in the area. Product availability may vary. Contact us for the most current availability on this product. Fabric Content Hand-rubbed leather saddle leather for a rich aged patina. Frame Construction Thick laminated hardwood frame with interlocking joints and unibody back for added strength, and a snug fit. Padding & Ergonomics High density foam that is engineered to hold up to use. 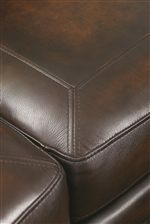 Polyester filled back cushions with channels to reduce cushion sagging. Encased pillow cores to keep fibers from making their way out of the cushion. Fully upholstered cushions are flip-able. You can usher traditional style into your home with the Hamilton collection. The pieces carry a hand-rubbed leather that delivers an old-world flair while the turned legs come in a Heirloom finish. The padded seat is seamed in a picture-frame style while the nailhead trimming comes on an antique brass. Create a classic look in your home with the stunning Hamilton leather collection. The Hamilton collection is a great option if you are looking for Traditional furniture in the area. Browse other items in the Hamilton collection from AHFA in the area.